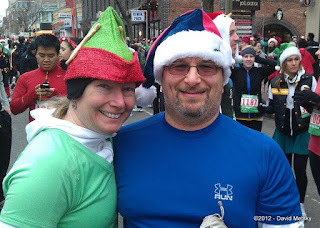 At the 2011 Somerville Jingle Bell Run I ran with Brenda, and Monica was our cheer leading section and head photographer. She enjoyed the experience so much that she said she wanted to train so she could run the race in 2012 - her goal after being out of running for a long time. Not only did she achieve that goal of running the race this year (in a very fetching elf costume I might add) but she raced a summer 5K series and a 5 miler up in NH, plus has added training runs every week. The run this year was just as much about being part of 5000 costumed crazies as it was about completing a task that was started a year earlier. This year's race was great; we had good costumes (Monica in green, Dave in blue), got a great parking spot, ran a good race, and easily made it into Redbones for the free meal and beer after. You can't ask for much more from a cold December Sunday with rain in the forecast. I've been talking about my goals for a while, and one that has been on my list but that hadn't yet come into fruition was running a 50K before my 50th birthday. My previous blog entry was about it and I talked about possible races I could enter. On 12/12/12 a message came across my facebook wall about a special offer to save $12 on the entry fee and I bit. A few keystrokes later and I'm officially registered for the Pineland Trail 50K. It felt great to take a tangible step toward my goal and commit publicly. The die is cast. Figuring out how to combine my ski schedule this winter and work related travel with long training runs will present some interesting challenges, but goals aren't meant to be easy. I'm working now to map out the training schedule and find a few kindred spirits to train with as I enter the new world of ultras. Once more into the breach!